Time tested recovery solution – Offroad Jacks explained. An offroad jack has been farmers, campers and 4WDers best friend for decades. Being avid 4WDers we are positive many people have their offroad Jack mounted to their 4WD without knowing all the tips and tricks you can do with one of these classic bits of kit! A 4×4 Jack uses clever spring-loaded pins and massive amounts of leverage to ratchet over 1 tonne worth of force over 1m high. It can also ratchet in the opposite direction allowing you to lower your vehicle. A 4WD jack can be used for dozens of purposes, the most obvious is for lifting very heavy things. We’ve seen some creative applications for the staggering 1050kg force this clever piece of machinery puts out. With a little ingenuity it can be used to straighten bent steering tie rods, against chassis crossmembers or even the vehicle’s diff. To operate an Offroad jack it’s as simple as placing your Jack base on the ground underneath your vehicles jacking point. Once the jack is in place, slide the jacking head into position along the jacking frame and then lock the jack into ‘lifting mode’, by lifting the operation latch until it clicks into place. You are now ready to jack. To jack your vehicle up, simply place one hand on the jacking frame and the other on the jack handle and cycle the jack handle until there is a little bit of tension on the jack. You can now use both hands on the jacking handle for extra safety. NB: It is wise to be cautious of the jacking handle whilst jacking up and down as when the handle is not latched, it has a lot of force on it and could cause injury. When you have the vehicle jacked as high as you need, latch your jacking handle in the vertical position. When you are ready to lower the jack, simply reverse the operation latch to the lower position until it clicks into place. Carefully grab the jacking handle with both hands, and cycle it to lower, again be cautious of the load on the handle as it can injure you. Once the jacking head has no load it will automatically slide to the bottom of the jack. Congratulations you now know how to jack with your high lift jack. Using the lifting power an offroad 4wd jack offers and a little bit of rigging knowledge an offroad jack’s massive pulling force can be used to inch a stuck 4WD out of trouble, in a primitive hand winching technique. This same technique can be used to straighten a 4wd’s bar work in case of unexpected strikes or impacts. You can also utilise the top jaw on your offroad 4WD jack to clamp like a vice. This means anything you need to be squeezed or clamped can easily have over 1000kg of force. This is great for dented rims or other offroad repairs. A 4WD offroad jack is perfect for picking your 4WD out of tricky situations when you are on the track, this is its intended purpose. For an example if your 4WD drops a wheel or gets itself stuck in soft sand, and you are fighting for traction. 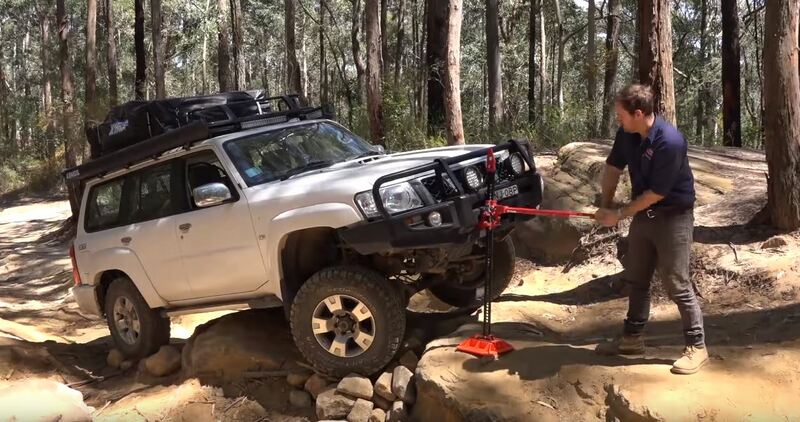 A high lift 4WD jack combined with an offroad jacking base will let you pick your vehicle up and out of the trouble, so you can pack underneath your tyres, allowing you to drive straight out of trouble with little to no sweat. If you have ever needed to break a tyre bead on the track a High lift jack is the perfect tool, by using the weight of your vehicle you can put pressure on the side wall of your tyre, breaking the bead with ease. coupled with a compressor and a Tyre repair kit you have the perfect all-purpose repair kit for any tyre dilemma! It’s hard to list everything that you can do with a high lift offroad jack, its simple operation means you are only limited by your imagination and the materials on hand. So get out there and see more and hit the tracks with confidence that you can get further with your offroad jack!